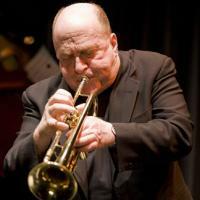 Join us as we honor the life and work of Lew Soloff, who passed away on Sunday, March 8th at the age of 71. We will preempt regular jazz programming on March 12th. Lew Soloff was born in Brooklyn on February 20, 1944 and began studying piano at an early age. At age ten, recordings of Roy Eldridge and Louis Armstrong inspired him to take up the trumpet. He graduated from Eastman School of Music and returned to New York City as a graduate student at the Juilliard School of Music. After a year in the program, he became immersed in the mid-1960’s New York jazz scene and endeavored to initiate a full-time career. One of his first New York engagements was with the Latin jazz band of Machito. By the mid-1960’s Soloff was a performing member of a number of bands led by Maynard Ferguson, Eddie Palmeiri, Tito Puente, Gil Evans, and Ornette Coleman, as well as the Joe Henderson/Kenny Dorham Big Band and the Thad Jones/Mel Lewis Band. His extensive discography includes recordings with Gil Evans, Carla Bley, George Benson, Miles Davis, Bob Belden, Benny Carter, Jimmy Scott, Aretha Franklin, the band Blood, Sweat, and Tears, for which he is best known, and the Manhattan Jazz Quintet, of which he was a founding member. He was a longtime faculty member at the Manhattan School of Music and continued to perform with the Manhattan Brass, Carnegie Hall Jazz Band, Lincoln Center Jazz Orchestra, as well as his own groups including the Lew Soloff Quartet and Lew Soloff and the Afro-Cuban Ensemble. Please tune in as we recognize the remarkable influence and career of Lew Soloff.